Seaport's plate department operates four state of the art Messer burning machines. 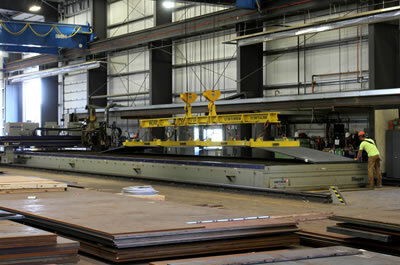 Two machines operate over 164 feet of contiguous table and include both plasma and oxy-fuel cutting capabilities along with a 5 axis plasma bevel head. Both machines have powder marking capabilities. In addition on a 120 foot contiguous table we have a double high definition plasma machine with powder marker on one end and a multi head oxy-fuel machine on the opposite end. This allows us a processing range from 16 gauge sheet up through 10 inch thick plate. 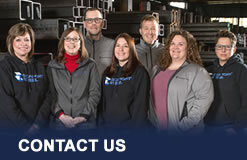 We have the capability to handle over 70 foot plates up to a 15 ton capacity. We support our plate department with a highly skilled programming staff offering lofting capabilities as well as DXF and drawing conversions.